I feel like I shouldn’t need to introduce this book or this series. If you’ve never read the Enchanted Forest Chronicles, what have you been doing with your life? Before Catherine, Called Birdy, before Ella Enchanted, before Robin McKinley’s heroines, Cimorene rocked my life. A princess who really just wants to fence, learn Latin, and be a dragon’s librarian/cook/mystery-solver? Sign me up, please. Add in Morwen, an acerbic, ginger-haired, hypercompetent witch with spectacles, bottomless sleeves, and a house full of attitudinal cats, and you have two pinnacles of no-nonsense badassery. In this first installment (actually published second, as the fourth book, chronologically, was the first written), Cimorene runs away from home and, thanks to the advice of a talking frog, promptly becomes the princess of a dragon named Kazul. While occupying her days with cooking, cataloguing, and fending off meddling wizards and persistent knights bent on her rescue, Cimorene uncovers a plot that threatens the dragon kingdom, and sets out to unravel it with the help of her new friends. 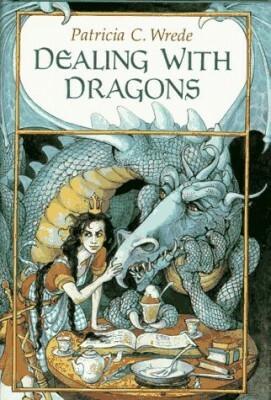 For the past few years I’ve been hunting down, very much out of order, the original hardback editions of the series, with Trina Schart Hyman’s cover illustrations (see above). When I finally got Dealing With Dragons, I couldn’t resist an immediate re-read, and luckily, the humor, energy, and inguenuity of Wrede’s writing hold up just as well with later reads. Though it’s clear to me now how utilitarian much of her writing is (e.g. “here I will insert a scene of Cimorene giving Kazul a bath so I have an excuse to make them talk about dragon history for a chapter”), and how often the plot relies on convenient coincidences to move it along, the characters are still utterly winning, and the world full of marvelous, clever detail. The book can be summed up, really, as delightful. I was also struck this time around by my realization of how extremely polite Cimorene is, at the same time that she’s entirely intolerant of fluff and indecision – I had remembered how sarcastic she is, but not how carefully and strategically sheathed she keeps that sarcasm. Tears of admiration were wiped! She makes me break out the all caps, because that’s just how awesome she is. ahhhhh!!!!! we patricia wrede fans are simply incapable of intelligent and complex adoration!!! This is one of those books I can remember reading and loving , but I could not for the life of me remember the title. “Princess who cooks for a dragon” just doesn’t jog peoples memories. More so when the elementary school library where I found them promptly rid themselves of the entire series not longer I after I finished this book. “Princess who cooks for a dragon” just doesn’t jog peoples memories. Anda, clearly you are not hanging out with the proper sort of people. Also, whoever in your library decided to get rid of the series – WORST DECISION. One of my friends is teaching 3rd graders, and just got Calling on Dragons out of her school library for one of her kids.